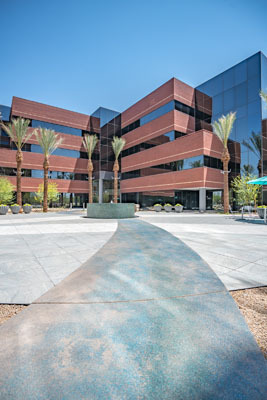 PHOENIX – To support the transport needs of its shippers, carriers and the evolving mobility sector, Manheim Logistics Solutions recently moved to a larger, upgraded office facility in Phoenix. Backed by a $2.7 million investment, the combined Ready Logistics and Central Dispatch operations now have ample space to accommodate anticipated business growth and expanded service offerings. Manheim Logistics signed a five-year lease for more than 51,000 square feet on the top two floors of the Sky Harbor Towers building. The redeveloped complex includes a dedicated training area, video teleconference capabilities, open workspaces for greater collaboration, a fitness center and a café. Located close to Manheim Arizona and Phoenix Sky Harbor Airport, the site provides added transport accessibility and convenience. The funds for the facility are in addition to an earlier investment the company made in its technology platforms, which helped Ready Logistics and Central Dispatch combined, transport close to ten million vehicles last year. “As Cox Automotive transforms the way the world buys, sells, owns and uses cars, Manheim Logistics is working to make transportation an inherent part of the automotive transaction rather than a separate one,” said Jim Williams, senior vice president of Logistics for Cox Automotive Inventory Solutions. Ready Logistics connects shippers and carriers on a full-service platform, offering seamless transportation solutions, value-added integrations and exceptional white-glove service. Clients save time as Ready Logistics selects an ideal transport option, based on performance and competitive pricing, from its 6,500+ partners that deliver 175,000 vehicles monthly. Central Dispatch connects dealers, brokers, shippers and others directly with carriers on the nation’s largest self-managed logistics subscription platform. Central Dispatch helps over 10,000 clients nationwide save money by negotiating and dispatching with 55,000+ trucks crossing the U.S. each week. “The move to an expanded facility supports our transition from offering full- and self- service options to being a provider that delivers seamless, combined solutions that meet clients’ diverse needs and drive value,” added Williams. Manheim is North America’s leading provider of end-to-end wholesale solutions for inventory management, buying and selling, floor planning, logistics, assurance and reconditioning. Manheim Logistics Solutions simplify vehicle transportation for dealers, auctions, commercial clients and car owners nationwide with its two offerings: Ready Logistics and Central Dispatch. Ready Logistics, a full-service option, moves vehicles quickly and conveniently, leveraging a network of 6,500+ carriers. Central Dispatch, a self-service option, offers a centralized communications platform that creates a simple and effective way to connect shippers and carriers. Headquartered in Atlanta, with its logistics office in Phoenix, AZ, Manheim is a Cox Automotive™ brand. For more information, visit press.manheim.com.